I pronounce you Husband and Wife….NEXT?!?!?! I would say the hightlight of my day was when I posed for a picture with my newly married co-worker and her husband perched directly behind them as if I had just married them myself. I hope that one doesn’t make its way into their photo album. 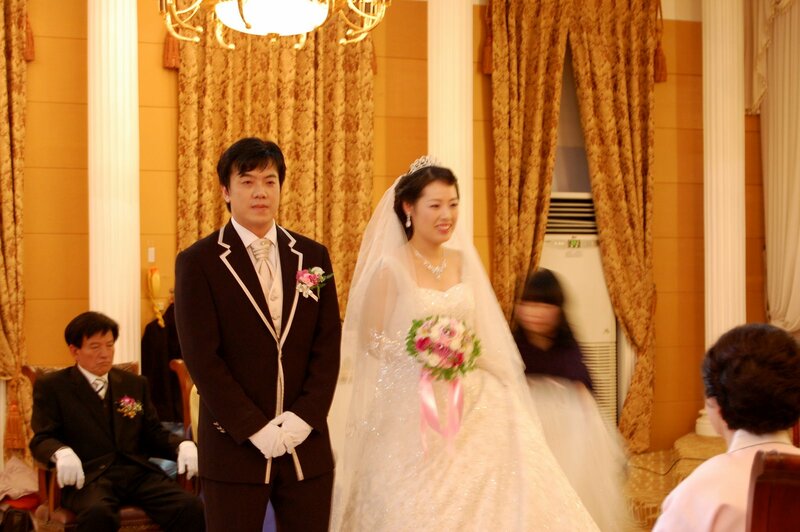 Lindsay and I woke up this morning both excited and anxious about our first Korean wedding. It meant getting a new cultural experience while also having awkward conversation with our co-teachers. Sometimes, when we talk to them it feels like we are giving them an oral exam. They tell us their answer and seem to sigh with relief if we show we understand. I don’t blame them. I felt myself refusing to speak the little Korean I know in front of them. But there are few opportunities to incorporate, “my stomach hurts” or “go straight please” into everyday conversation with your co-workers. Since we don’t hear too much about our co-teachers lives, we were a little surprised when Moon told us about two months ago that she was getting married. We had gathered she had been dating a guy for a year, but we weren’t sure when, or if, they would get married. Today, we tried to familiarize ourselves with her new groom, but our teachers couldn’t help us with any info. I mean nothing. My first (and last) question was “So what is Moon’s husband-to-be’s name?” No one could tell us. We met our co-teachers at an Outback Steakhouse near the Wedding Center where we ate a family style lunch on the bride and groom’s tab. The main dinner was too crowded for us. We nonchalantly made our way over to the Center about the time the wedding started and walked in mid-ceremony. Not a big deal. The ceremony itself was something akin to a sporting event where people come and go as they please and talk to their neighbors without paying too much attention to the main event. At one point during the ceremony, I broke out in a cold sweat when I remembered my cell phone was still on. Then I remembered I was in Korea, if someone called I could take it, even if it was during a wedding. 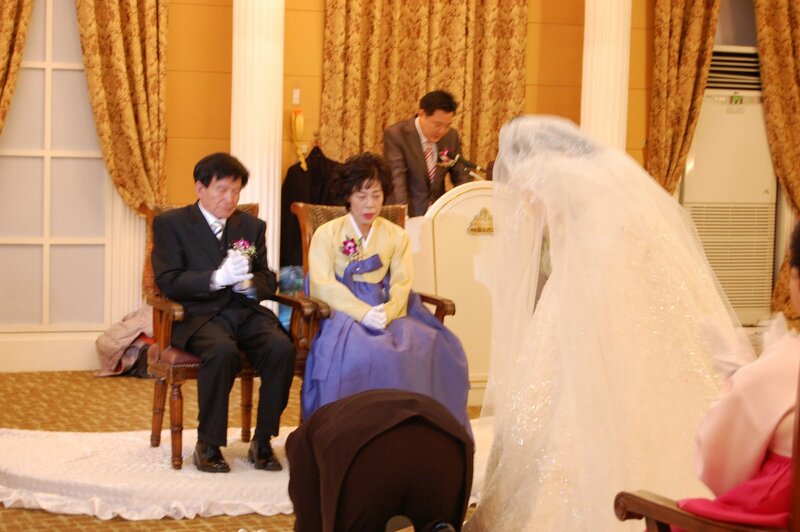 The wedding really seemed to encompass modern Korean culture. For example, the venue was similar to a convention center back home. The weddings in these things were like business meetings that started and ended at specified times. Before and after these meetings there were other meetings, and you better be out so the other meeting can start on time. People were packed into this three story building going to various weddings. Brides walked around in 5 inch heels, women dressed like flight stewardesses performed various duties in and outside of the ceremonies and Koreans bumped into Koreans trying to get to or from a ceremony. The ceremony had flashes of formality. 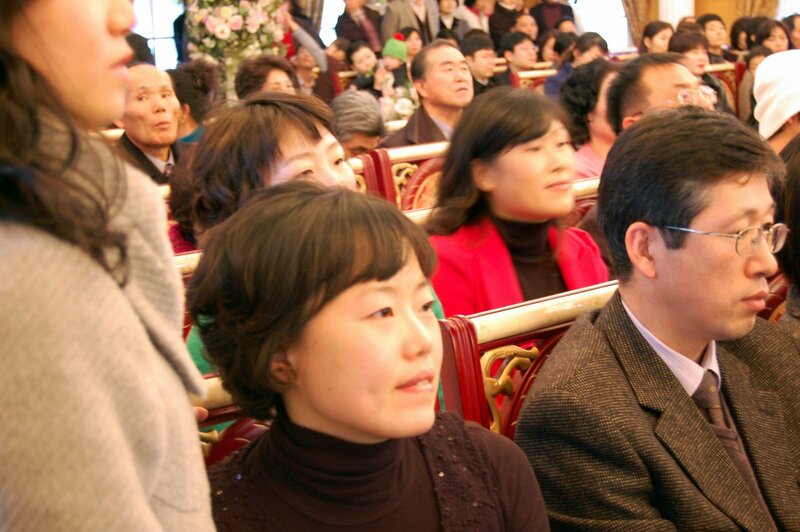 The mothers wore the traditional dress (hanboks) the fathers wore nice suits and no one smiled. After the couple married, they bowed to both sets of parents who sat in chairs just behind the bride and groom. We clapped. Then there was the girl responsible for the bride’s train. She wore cut-up jeans and a hooded sweat shirt and looked highly annoyed to be working on Saturday. Then the stewardesses came in carrying trumpets. The bride and groom faced us walked down the aisle, I looked at the trumpets waiting for them to blow them out like they do during royal weddings. Instead long strands of purple streamers and confetti shot straight down the aisle at the bride and groom. Somewhere a bubble machine was working overtime. It was a sight to behold. Then came the pictures. A photographer that thought he was funny. “I think he talks too much,” Young Mi whispered to Lindsay as he barked out directions in his silver suit and big smile. I love the video!! The lady almost knocks the bride, in her one shining moment, out of the way. In America she would never be forgiven. NEVER! !